This year’s CLE programs feature hours of practice-oriented programs mixed with broad-based, dynamic topics on which our sections and conferences have collaborated. Your Annual Meeting registration fee includes admission to these programs; your badge will serve as your ticket. 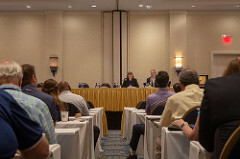 You must be registered for the Annual Meeting to receive CLE credit for attendance at any seminar on Friday or Saturday. Separate registration is required for Virginia CLE's Recent Developments Seminar on Thursday, June 13.